Are you facing challenges while managing your pediatric medical billing requirements? Pediatric medical billing is different from other types of medical billing. There are a few specific requirements that the medical biller has to take care of, e.g. vaccine billing. This is something that many pediatric medical billing experts tend to overlook or forget, which causes the healthcare organization to lose a sizeable chunk of their revenue. If you are facing the same and unable to churn up revenue, then outsource pediatric medical billing services to us. Outsource2india is a leading provider of pediatric medical billing services in India and has been catering to different medical billing needs of global healthcare clients for the past 20 years. We have a team of capable medical billers, healthcare support personnel, reimbursement experts, etc. They can streamline your pediatric medical billing process and reduce the denials considerably, thus giving you ample time to focus on patient care. Insurance eligibility verification is a crucial stage of the revenue cycle where the patient's eligibility is checked against his/her insurance coverage. A correctly entered medical claim needs exact insurance information, otherwise, you will not receive the insurance amount from the payer. Our team of pediatric medical billing specialists is proficient in deciding if the insurance claims will be processed successfully or denied by examining its coverage and other benefits. Account receivable follow-up needs an organized follow up with the payer, which entails the suffice number of workforce and time. If you are not able to successfully handle the AR follow-ups, then collaborate with us. Our team can help you with the AR follow-ups that will ensure a prompt payment, thus helping you keep a steady cash flow in your organization. A correctly entered patient demographics will ensure that the claim will process quickly. However, many healthcare organization do not achieve 100% correct patient demographics entry due to factors such as lack of workforce, dearth of time, etc. When you decide on outsourcing pediatric medical billing services to us, we can help you with correct patient demographic entry services for your pediatric medical billing process. 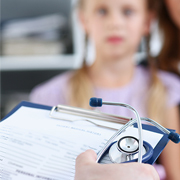 Our team of pediatric medical billing specialists can accurately enter all the patient data. An effective denial management process can help you find the whys and wherefores of the claim denials. With our extensive experience in the denial management services, we can assist you with the denial analysis that can recover your revenue cycle and minimize the odds of claim denials. The charge entry helps find out the total reimbursement amount in a healthcare organization. Thus, when you offshore pediatric medical billing services to us, our team can record all the charges for each pediatric-related claim. This will enable your facility to improve its cash flow by receiving timely reimbursements. Why Choose O2I for Pediatric Medical Billing Services? We have adopted some of the best practices for pediatric medical billing and offer a flexible pricing model to suit your medical organization's medical billing needs, irrespective of its size. We also offer customized pediatric medical billing services based on the volume of the claims, number of work hours, percentage collection, etc. Outsource2india has achieved ISO 27001:2013 certification that reflects our commitment to set up, implement, and secure the security parameters within the framework of your medical facility. We are adept in safeguarding your medical information against any security mishaps. We strictly follow HIPAA compliance regulations and our company is ISO 9001:2000 certified organization. We implement all the mandated HIPAA compliance regulations at our workspace and delivery centers to safeguard the privacy and confidentiality of protected health information (PHI) as per its guidelines. We have five global delivery centers across different time zones which enable us to be accessible 24/7 and deliver immediate support to resolve your issues/queries. We can also collect the client's requirement at their location by leveraging the delivery centers. We make use of the best medical billing software and our offices are equipped with virus prevention software, VPN communications system, rock-solid firewalls, URL filtering tools, spam filters, etc. We only rely on secure servers to download/send the medical/patient info from your facility. We leverage FTP to transmit the files, which are again encrypted and can be only opened via cleartext passwords. Moreover, we also conduct regular security audits to ensure that all our processes are following the mandatory compliance guidelines. Our pediatric medical billing specialists can maximize your ROI by cutting down the general reimbursement issues. We have a devoted team of quality assurance experts who make sure that the pediatric medical billing goes according to the plan. Until now, we are successful in keeping 98% accuracy that exceeds the present-day medical billing industry standards. If you do not have the required bandwidth to scale up the medical billing in case the number increases, then do not worry. We can scale up our services whenever you demand so. This way you will be freed from the concerns of boosting your infrastructure or hiring more resources. When you outsource pediatric medical billing services to us, we will assess your patients' volume to figure out the scope and extent of the medical billing services. This way we can streamline the medical project that will help us address all your concerns related to the pediatric medical billing. Thus, you will see an immediate spike in your healthcare facility's efficiency level. We exert exceptional professionalism by making use of automated software, quality assurance, and healthcare support staff. Hence, when you choose us for outsourcing pediatric medical billing services, your pediatricians will be able to save time and focus on their core tasks. We have more than 200+ medical billers who can fix your organization's revenue cycle by recovering the medical claim due, streamlining the pediatric billing process, etc. With us, your establishment's cash influx will grow, and you will see a positive influence on your net ROI. Our 24/7 available contact support representatives can deliver round the clock support. You can call, message, ping, and mail us at your convenient time to report or raise any doubts/issues/inconsistencies, etc. Outsource2india has been the industry's expert in providing quality pediatric medical billing services and a plethora of other medical billing and coding support services for the last 20 years. We have gained vast experience in catering to the wide-ranging requirements of the clients from across the globe. Our team includes some of the most skilled medical billers, insurance experts, reimbursement specialists, and healthcare support staff. Our pediatric medical billing is highly streamlined, and we leverage our delivery centers to provide the necessary medical billing services with a quick turnaround. If you are looking for an accurate, reliable and affordable pediatric medical billing services, then you can stop looking. Get in touch with us today!